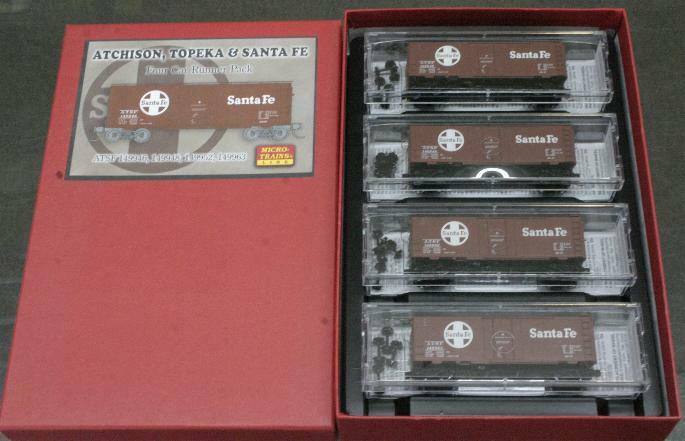 Another quick posting: Here's the first look at what is hoped to be a long line of "Runner Packs" from Micro-Trains. As Runner Packs are announced, they are posted to the appropriate Release Tables (by year). Reviews of these packs are put in the subscriber edition (only) of the UMTRR when they're announced to help enable pre-order decisions. 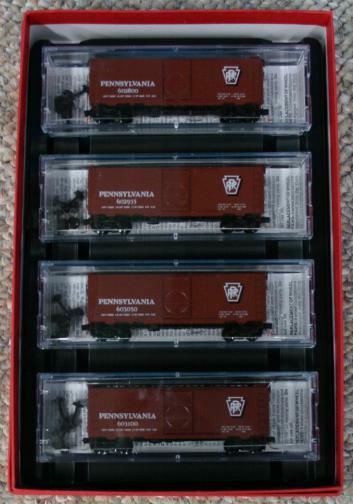 Runner Pack #1 is a set of four forty foot single door steel boxcars painted for the Pennsylvania Railroad, with the "Shadow Keystone" variation of the famous herald and the use of "calendar style" for the road numbers. MTL packaged in this attractive red heavy cardstock box. I suspect this will attract more than just runners. I had guessed that there would only be a simple shrinkwrap enclosing the four cars. 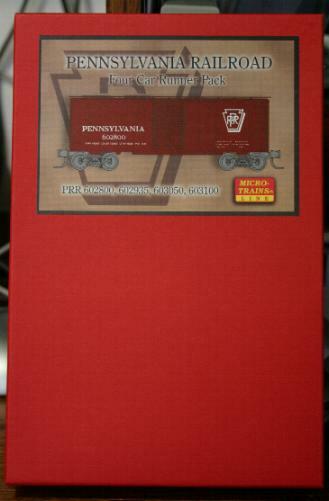 This will look much better on the shelves of those Authorized Micro-Trains Dealers (well, we would expect they wouldn't sit on the shelves for long anyway!). Close up of the box label. There would be a different label for each pack, of course. OK, maybe this is a little too detailed, even for me... but for the record, yes there is a price sticker mounted to the bottom right corner of the underside of the box. 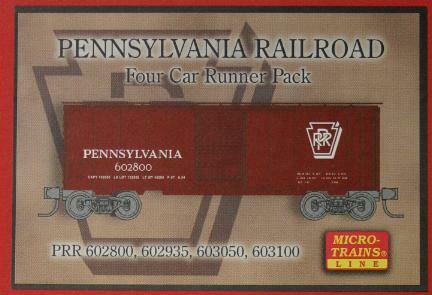 With the street price running as much as 25% off this, you're getting a great deal on Micro-Trains cars here. This is very competitive with other offerings, and the MTL trucks and couplers are already on the equipment. Opening the box, we see a heavy plastic insert into which are mounted the four cars in standard MTL boxes. I would think this is how the first six packs will be delivered as they all use the same size boxes. Note that each car does come with the low profile wheels which have been included with regular run releases for a number of years now. Now he's done it... broken up the pack! Anyway, here's what the label looks like. 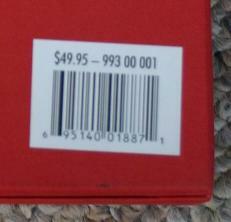 Note that the catalog number is a bit different. A standard reprint on this car would be "020 00 780" but per MTL documentation protocol items within sets and packs get a 5x designation as the middle two digits. These four cars are 51, 52, 53, and 54. I didn't realize that MTL would be using these designations so I had to scramble to fix up my 2007 Release Table. It's correct now. 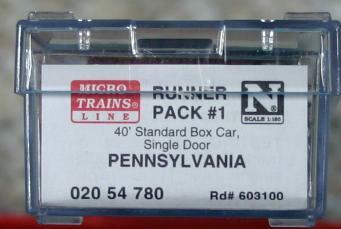 Also note that the label explicitly calls out "Runner Pack". There's no UPC code or price on these labels so as said in the grocery business, "Product Not Labeled for Individual Sale." Now he's really done it... taken a car out of the box! Hey, it's a runner pack! Bottom right of this "family portrait" is PRR 602800, numerically first of this set of four. Above at top right is PRR 603125, the most recent previous release (December 2000). By my eye -- and by the camera's too, although more pronounced in the image-- the new run looks a shade lighter in color. Bottom left is PRR 603120, the middle of three "Runner Series" cars (August, September and October 1995). Note the brown is closer to that amorphous "Boxcar Red"; there's more brown in the color. Finally, at top left is PRR 602347, the first run of this car by Kadee (September 1987). The dark brown and the road number isn't really prototypical. So, we not only have a "family portrait" here, but Continuous Improvement. 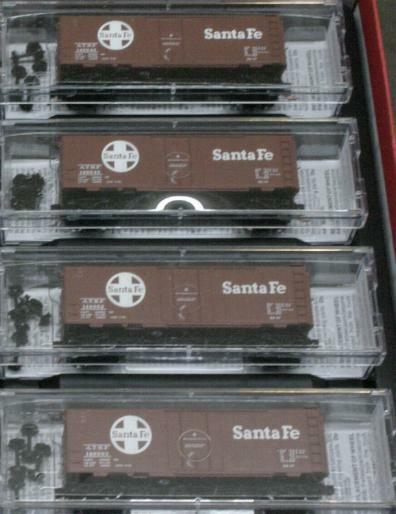 Courtesy of Kel Cruise, here are two images of Runner Pack #2, a quartet of forty foot plug door boxcars for the Santa Fe. That circle cross paint scheme might be a bit incongruous with the body style, and the real ATSF had just a handful of forty foot plug door boxcars, but how much of an issue that is I'll leave up to the modeler. First is the pack in its box. Here's a bit of a closeup of the cars. Thanks, Kel!